Head Size 8.5" x 11.5" x 3.25 "
Precise spectral measurements across the 350nm to 2500nm spectral range are acquired in seconds. Small, lightweight & easily operated by one person. Incorporates 100% linear array technology and cooled InGaAs detectors, providing superior wavelength and radiometric stability. Leading edge detector arrays provide superior NER and low noise data. Fixed foreoptics ensure a rugged and reliable optical path. Fast, full spectral measurements made with no moving gratings. Internal CPU allows for measurements without a computer. Supplied with rugged PDA with Bluetooth wireless & GPS. Internal memory stores a full day's data. Wireless communication facilitates canopy measurements. Field changeable fiber optic light guide options available. Integral, removable Lithium Ion battery reduces weight & enhances mobility. Reflectance Probes and Cosine Receptors available. Data is provided by channel in a columnar format. Software tools for resampling are provided. 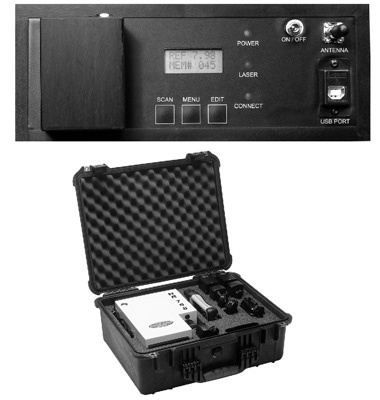 The HR-1024 is furnished with two versions of SVC's proprietary software. One operates of SVC's proprietary software. One operates computers using Windows XP. The second supports PDAs running the industry-standard Windows Mobile 2003 software for Pocket PC. The DAP Technologies Microflex 2240 PDA provided with the HR-1024 is an extremely rugged, reliable, and lightweight unit. It is waterproof and drop resistant to IP67 and MIL-STD-810F ratings. 10+ hour battery life, light weight, easy to use keypad and compact size all contribute to ease of operation. Spectral data may be viewed in real time on the sunlight readable color display. Non-volatile Flash memory guards against the loss of valuable field data. RS-232 and USB ports provide optimum connectivity in the field or in the lab. Bluetooth wireless communication and embedded GPS card streamline and enhance your SVC HR-1024 data collections. SVC can also supply optional, ruggedized laptop computers upon request. 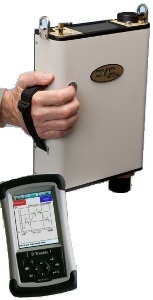 Building on more than 20 years of experience in the remote sensing field, Spectra Vista Corporation has once again advanced the state of the art in full range field-portable spectroradiometers. The new SVC HR-1024 achieves the highest level of spectral resolution in the full VIS-NIR-SWIR region. The use of 100% linear array detectors ensures excellent wavelength stability, while the thermoelectrically cooled InGaAs and Extended InGaAs detectors provide superior radiometric stability. Every design element of the SVC HR-1024 reflects an understanding of the demands of field data collection. Fixed foreoptics and hard-mounted internal spectrometer elements provide a robust optical path. This ensures the SVC HR-1024 will deliver reliable data under the most demanding field campaigns for years to come. An internal CPU enables a full day's data to be taken without an external computer, allowing the operator to concentrate on the subject and produce full spectral acquisitions in less than 5 seconds. The rugged, lightweight PDA (provided) enables users to view data in real time via the wireless Bluetooth technology. 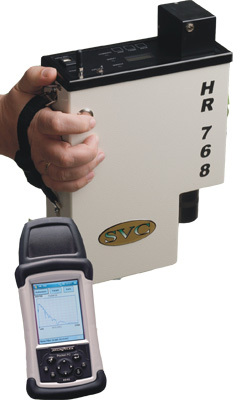 The SVC HR-1024 software automatically records the longitude, latitude and time of day, from the PDA's GPS receiver, for each spectral measurement. This greatly eases record keeping in the field while providing positive, coded identification during data analysis. 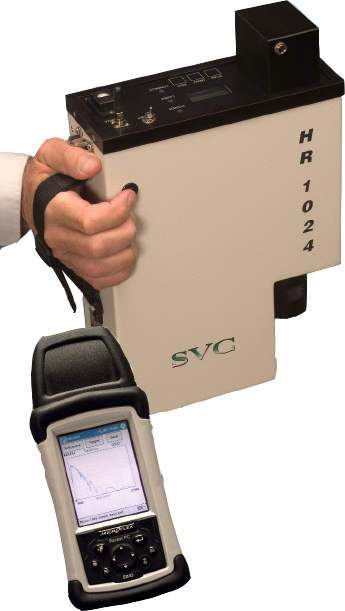 The SVC HR-1024, weighing less than 8 pounds, is the lightest and the most portable field spectroradiometer in its class. The system is available with many optional optics and fiber optic bundles that are easily changed in the field. 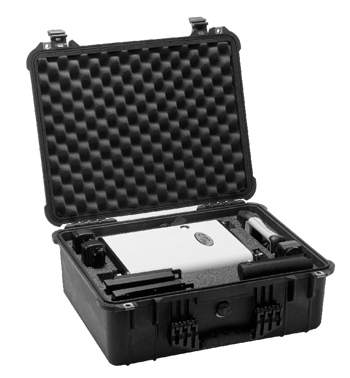 All system components are furnished in a rugged, waterproof field case. Spectra Vista Corporation manufactures a full range of new generation Airborne Hyperspectral and Multispectral Imaging Systems. There are three basic EPS Series scanners, with different aperture sizes. The baseline band configuration for each series is described in the table below. Systems can also be tailored to specific customer requirements. Configuration options and band substitutions are available for all regions.